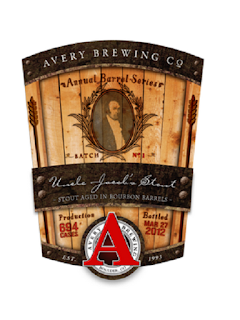 Avery Brewing Co.'s Releasing Their New Uncle Jacob's Stout on April 7th! Annual Barrel Series Release Party! "Jacob Spears, our 6th Great Grand Uncle, is credited as the first distiller to label his whiskey "Bourbon." He built his distillery in Bourbon County Kentucky in 1790 - 203 years before we began brewing. While obviously a bit too late to produce Uncle Jacob's wash, we've instead created something far more complex. In his honor, we present this 17.4% ABV robust, silky smooth, full-bodied and altogether extremely American rendition of an Imperial Stout aged for 6 months in the very finest Bourbon barrels. This explains a lot about our penchant for big brews! It's in our blood! We will christen Uncle Jacob's return on April 7th, 2012, at the Avery Tap Room, celebrating with grub, banjo picking, and a very fine Avery hoedown! Bottles are 12oz. and will be sold as singles at $10 each. You can snare up to 12 bottles, and availability can only be guaranteed at the Avery Tap Room during this special congregation. Sales will begin at 5pm. Come join us on this historic occasion, and celebrate the revival of Uncle Jacob!" If you are in the area, this would be a great chance to try what is sure to be a great beer!